The clamps are made using the fiddly sand core to create the original recess profile to the tall clamps which also produces a stronger casting compared to an alternative solid infill type. 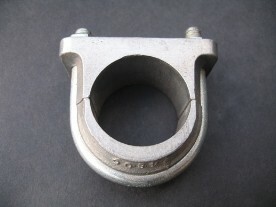 With the original clamps, over-tightening or misuse could cause cracking to the U-section bottom casting or cause a corner section of the platform to simply break off. Platform main centre sections do not fail in the original design. We cannot improve on the original MG design this time. The clamps have been produced with surplus length to the stud section as these are now used on the VMGP supercharger kits although, by way of a helpful tip, we recommend using radiator hose to make up the difference in diameter when fitting to the 1 inch diameter u-tube. This also has the benefit of providing cushioned rear mounting points for the blower. We also supply support u-tubes. 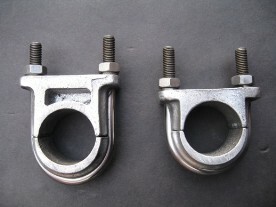 The photo on the right is a slightly larger version as used on the K Type which can easily be manufactured if there is sufficient demand (original K Type bracket shown).